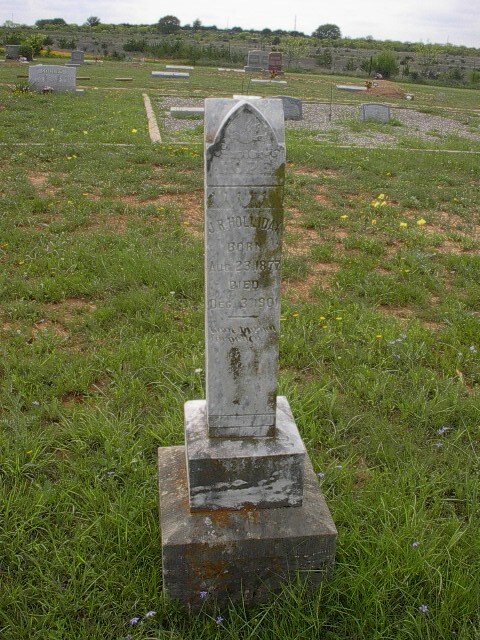 FRANCIS AYRES HOLLIDAY was born 26 Aug 1842 in Copiah County, MS, and died 12 Jan 1910 in Hext, Menard County, Texas. 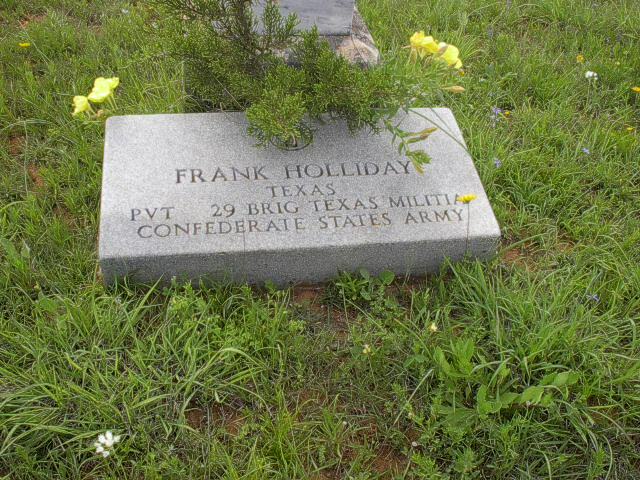 He was the son of Thomas Johnston Holliday and Margaret Emily Patton. He married JENNETTA PAGE in Texas, daughter of ANDREW JACKSON PAGE and CATHERINE WINDSOR. 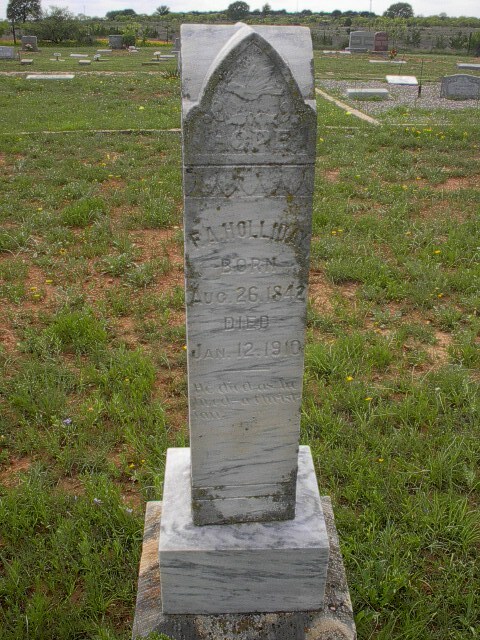 She was born Jun 1851 in Texas, and died 05 Jul 1913 in Brady, McCulloch County, TX. 21st Cavalry Regiment [also called 1st Texas Lancers] was organized during the spring of 1862, with about 800 men. They were from Parker, Dallas, Bell, and Austin counties. It was assigned to Hawes’, Cooper’s, Steele’s, and Lane’s Brigade in the Trans-Mississippi Department. The unit was active in Marmaduke’s Missouri Raid, then skirmished in various conflicts in Louisiana where a detachment reported 5 killed and 4 wounded at Calcasieu Pass. Later it saw action in Arkansas. The 21st disbanded before the surrender in June, 1865. Colonel George W. Carter, Lieutenant Colonel DeWitt C. Giddings, and Major Benjamin D. Chenoweth were in command. EMILY CATHERINE HOLLIDAY b. Nov 1870, Victoria, Victoria County, TX; d. Mernard County, TX. ROBERTA JULIA HOLLIDAY b. 22 Aug 1877, Tom Green County, TX; m. ISAAC HOWELL, 06 Feb 1901, Menard County, TX (Source: Menard County, TX Marriage Book 2, Page 69.). MARY FLORENCE “MINNIE” HOLLIDAY b. Jul 1886; d. Mar 29, 1947, Edwards County, TX; m. Leonard Almer Hitower Placker Jr, 25 Apr 1900, Menard County, TX. He was b. Jul. 16, 1880 in Texas, d. Feb. 27, 1960, San Angelo, Tom Green Co., TX. Burial Rocksprings Cemetery, Edwards Co, TX. Roy Francis Holliday b. 17 Jul 1887, Menard County, TX; d. 26 Aug 1955, Brady, McCullcoch County, TX. ARTIE ANN HOLLIDAY b. 19 Jun 1894, Menard County, TX; d. 18 Mar 1969, McCulloch County, TX.